Come live at East Market, and enjoy shopping, dining, and entertainment steps from your door. This freshly painted move in ready 2 bedroom + den, 1 bath condo has an amazing urban vibe with polished concrete floors and lofty ceilings. The open concept kitchen offers brand new stainless steel appliances and a moveable island to allow for a flexible floorplan. The living area has an abundance of windows and a patio door to a great sized balcony offering additional entertaining space. The Master bedroom is nicely tucked down the hall and the 2nd bedroom has clever space saving sliding door. The main bathroom has a tiled bathtub/shower combo. The well designed den has 2 sliding doors offering access from hall or master. A convenient in suite laundry closet, a locker and 1 parking space are included. 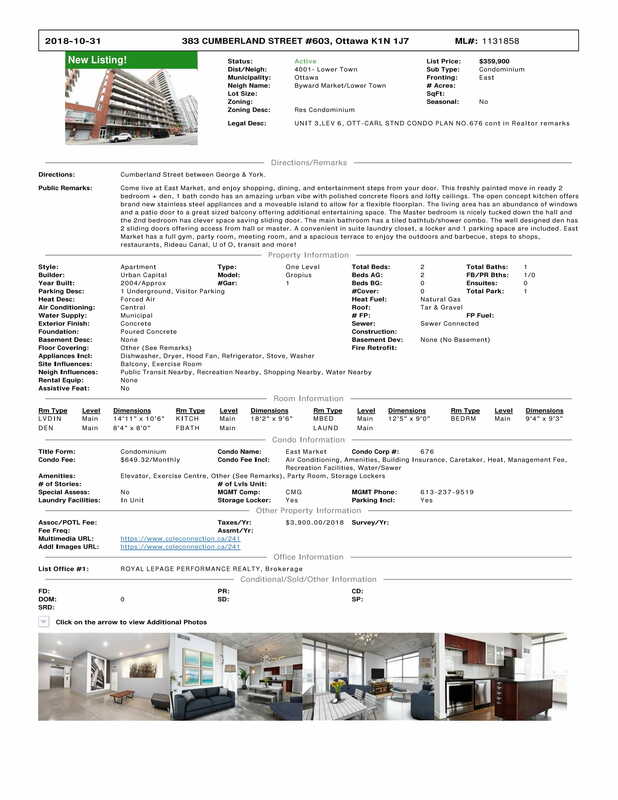 East Market has a full gym, party room, meeting room, and a spacious terrace to enjoy the outdoors and barbecue, steps to shops, restaurants, Rideau Canal, U of O, transit and more!